In this report, we review recent developments in the determinants of aggregate demand and net exports, and provide estimates of two scenarios: one which assumes business as usual and the other an alternate scenario simulating the medium-term impact of an acceleration in investment. We conclude with a discussion on the sustainability of Greek government debt, showing that it is crucial that the cost of borrowing remains below the nominal growth of national income. How Long Before Growth and Employment Are Restored in Greece? The Greek economy has not succeeded in restoring growth, nor has it managed to restore a climate of reduced uncertainty, which is crucial for stabilizing the business climate and promoting investment. On the contrary, the new round of austerity measures that has been agreed upon implies another year of recession in 2016. After reviewing some recent indicators for the Greek economy, we project the trajectory of key macroeconomic indicators over the next three years. Our model shows that a slow recovery can be expected beginning in 2017, at a pace that is well below what is needed to alleviate poverty and reduce unemployment. We then analyze the impact of a public investment program financed by European institutions, of a size that is feasible given the current political and economic conditions, and find that, while such a plan would help stimulate the economy, it would not be sufficient to speed up the recovery. Finally, we revise our earlier proposal for a fiscal stimulus financed through the emission of a complementary currency targeted to job creation. Our model shows that such a plan, calibrated in a way that avoids inflationary pressures, would be more effective—without disrupting the targets the government has agreed upon in terms of its primary surplus, and without reversing the improvement in the current account. The Greek economy has the potential to recover, and in this report we argue that access to alternative financing sources such as zero-coupon bonds (“Geuros”) and fiscal credit certificates could provide the impetus and liquidity needed to grow the economy and create jobs. But there are preconditions: the existing government debt must be rolled over and austerity policies put aside, restoring trust in the country’s economic future and setting the stage for sustainable income growth, which will eventually enable Greece to repay its debt. In this latest Strategic Analysis, the Institute’s Macro Modeling Team examines the current, anemic recovery of the US economy. The authors identify three structural obstacles—the weak performance of net exports, a prevailing fiscal conservatism, and high income inequality—that, in combination with continued household sector deleveraging, explain the recovery’s slow pace. Their baseline macro scenario shows that the Congressional Budget Office’s latest GDP growth projections require a rise in private sector spending in excess of income—the same unsustainable path that preceded both the 2001 recession and the Great Recession of 2007–9. To better understand the risks to the US economy, the authors also examine three alternative scenarios for the period 2015–18: a 1 percent reduction in the real GDP growth rate of US trading partners, a 25 percent appreciation of the dollar over the next four years, and the combined impact of both changes. All three scenarios show that further dollar appreciation and/or a growth slowdown in the trading partner economies will lead to an increase in the foreign deficit and a decrease in the projected growth rate, while heightening the need for private (and government) borrowing and adding to the economy’s fragility. Is Greece Heading For a Recovery? With the anti-austerity Syriza party continuing to lead in polls ahead of Greece’s election on January 25, what is the outlook for restoring growth and increasing employment following six years of deep recession? Despite some timid signs of recovery, notably in the tourism sector, recent short-term indicators still show a decline for 2014. Our analysis shows that the speed of a market-driven recovery would be insufficient to address the urgent problems of poverty and unemployment. And the protracted austerity required to service Greece’s sovereign debt would merely ensure the continuation of a national crisis, with spillover effects to the rest of the eurozone—especially now, when the region is vulnerable to another recession and a prolonged period of Japanese-style price deflation. Using the Levy Institute’s macroeconometric model for Greece, we evaluate the impact of policy alternatives aimed at stimulating the country’s economy without endangering its current account, including capital transfers from the European Union, suspension of interest payments on public debt and use of these resources to boost demand and employment, and a New Deal plan using public funds to target investment in production growth and finance a direct job creation program. Is Rising Inequality a Hindrance to the US Economic Recovery? The US economy has been expanding moderately since the official end of the Great Recession in 2009. The budget deficit has been steadily decreasing, inflation has remained in check, and the unemployment rate has fallen to 6.7 percent. The restrictive fiscal policy stance of the past three years has exerted a negative influence on aggregate demand and growth, which has been offset by rising domestic private demand; net exports have had only a negligible (positive) effect on growth. As Wynne Godley noted in 1999, in the Strategic Analysis Seven Unsustainable Processes, if an economy faces sluggish net export demand and fiscal policy is restrictive, economic growth becomes dependent on the private sector’s continuing to spend in excess of its income. However, this continuous excess is not sustainable in the medium and long run. Therefore, if spending were to stop rising relative to income, without either fiscal relaxation or a sharp recovery in net exports, the impetus driving the expansion would evaporate and output could not grow fast enough to stop unemployment from rising. Moreover, because growth is so dependent on “rising private borrowing,” the real economy “is at the mercy of the stock market to an unusual extent.” As proved by the crisis of 2001 and the Great Recession of 2007–09, Godley’s analysis turned out to be correct. Fifteen years later, the US economy appears to be going down the same road again. Postrecession, foreign demand is still weak and the government is maintaining its tight fiscal stance. Once again, the recovery predicted in the latest Congressional Budget Office report relies on excessive private sector borrowing, and once again, the recovery is at the mercy of the stock market. Given that the income distribution has worsened since the crisis—continuing a 35-year trend—the burden of indebtedness will again fall disproportionally on the middle class and the poor. In order for the CBO projections to materialize, households in the bottom 90 percent of the distribution would have to start accumulating debt again in line with the prerecession trend while the stock of debt of the top 10 percent remained at its present level. Clearly, this process is unsustainable. The United States now faces a choice between two undesirable outcomes: a prolonged period of low growth—secular stagnation—or a bubble-fueled expansion that will end with a serious financial and economic crisis. The only way out of this dilemma is a reversal of the trend toward greater income inequality. In this report, we discuss alternative scenarios for restoring growth and increasing employment in the Greek economy, evaluating alternative policy options through our specially constructed macroeconometric model (LIMG). After reviewing recent events in 2013 that confirm our previous projections for an increase in the unemployment rate, we examine the likely impact of four policy options: (1) external help through Marshall Plan–type capital transfers to the government; (2) suspension of interest payments on public debt, instead using these resources for increasing demand and employment; (3) introduction of a parallel financial system that uses new government bonds; and (4) adoption of an employer-of-last-resort (ELR) program financed through the parallel financial system. We argue that the effectiveness of the different plans crucially depends on the price elasticity of the Greek trade sector. Since our analysis shows that such elasticity is low, our ELR policy option seems to provide the best strategy for a recovery, having immediate effects on the Greek population's standard of living while containing the effects on foreign debt. If the Congressional Budget Office’s recent projections of government revenues and outlays come to pass, the United States will not grow fast enough to bring down the unemployment rate between now and 2016. The public sector deficit will decline from present levels, endangering the sustainability of the recovery. But as this new Strategic Analysis shows, a public sector stimulus of a little over 1 percent of GDP per year focused on export-oriented R & D investment would increase US competitiveness through export-price effects, resulting in a rise of net exports, and slowly lower unemployment to less than 5 percent by 2016. The improvement in net export demand would allow the US economy to enter a period of aggregate-demand rehabilitation—with very encouraging consequences at home. Employment in Greece is in free fall, with more than one million jobs lost since October 2008—a drop of more than 28 percent. In March, the “official” unemployment rate was 27.4 percent, the highest level seen in any industrialized country in the free world during the last 30 years. In this report, Levy Institute President Dimitri B. Papadimitriou and Research Scholars Michalis Nikiforos and Gennaro Zezza present their analysis of Greece’s economic crisis and offer policy recommendations to restore growth and increase employment. This analysis relies on the Levy Institute’s macroeconomic model for the Greek economy (LIMG), a stock-flow consistent model similar to the Institute’s model of the US economy. Based on the LIMG simulations, the authors find that a continuation of “expansionary austerity” policies will actually increase unemployment, since GDP will not grow quickly enough to arrest, much less reverse, the decline in employment. They critically evaluate recent International Monetary Fund and European Commission projections for the Greek economy, and find these projections overly optimistic. They recommend a recovery plan, similar to the Marshall Plan, to increase public consumption and investment. Toward this end, the authors call for an expanded direct public-service job creation program. Back to Business as Usual? Or a Fiscal Boost? Though the economy appears to be gradually gaining momentum, broad measures indicate that 14.5 percent of the US labor force is unemployed or underemployed, not much below the 16.2 percent rate reached a full year ago. In this new report in our Strategic Analysis series, we first discuss several slow-moving factors that make it difficult to achieve a full and sustainable economic recovery: the gradual redistribution of income toward the wealthiest 1 percent of households; a failure to fully stabilize and reregulate finance; serious fiscal troubles for state and local governments; and detritus from the financial crisis that remains on household and corporate balance sheets. These factors contribute to a situation in which employment has not risen fast enough since the (supposed) end of the recession to significantly increase the employment-population ratio. Meanwhile, public investment at all levels of government fell from roughly 3.7 percent of GDP in 2008 to 3.2 percent in the fourth quarter of 2011, helping to explain the weak economic picture. For this report, we use the Levy Institute macro model to simulate the economy under the following three scenarios: (1) a private borrowing scenario, in which we find the appropriate amount of private sector net borrowing/lending to achieve the path of employment growth projected under current policies by the Congressional Budget Office (CBO), in a report characterized by excessive optimism and a bias toward deficit reduction; (2) a more plausible scenario, in which we assume that the federal government extends certain key tax cuts and that household borrowing increases at a more reasonable rate than in the previous scenario; and (3) a fiscal stimulus scenario, in which we simulate the effects of a fully “paid for” 1 percent increase in government investment. The results show the importance of debt accumulation as a consideration in macro policymaking. The first scenario reproduces the CBO’s relatively optimistic employment projections, but our results indicate that this private-sector-led growth scenario quickly brings household and business debt to new all-time highs as percentages of GDP. We note that the CBO makes its projections using an orthodox model with several common, but fundamental, flaws. This makes possible the agency’s result that current policies will reduce the unemployment rate without a run-up in the private sector’s debt—“business as usual,” in the words of our report’s title. The policies weighed in the second scenario do not perform much better, despite a looser fiscal stance. Finally, our third scenario illustrates that a small, tax-financed increase in government investment could lower the unemployment rate significantly—by about one-half of 1 percent. A stimulus package of this size might be within the realm of political possibility at this juncture. However, our results lead us to surmise that it would take a much more substantial fiscal stimulus to reduce unemployment to a level that most policymakers would regard as acceptable. Fiscal austerity is now a worldwide phenomenon, and the global growth slowdown is highly unfavorable for policymakers at the national level. According to our Macro Modeling Team's baseline forecast, fears of prolonged stagnation and a moribund employment market are well justified. Assuming no change in the value of the dollar or interest rates, and deficit levels consistent with the Congressional Budget Office’s most recent “no-change” scenario, growth will remain very weak through 2016 and unemployment will exceed 9 percent. In an alternate scenario, the authors simulate the effect of new austerity measures that are commensurate with the implementation of large federal budget cuts. Here, growth falls to 0.06 percent in the second quarter of 2014 before leveling off at approximately 1 percent and unemployment rises to 10.7 percent by the end of 2016. In their fiscal stimulus scenario, real GDP growth increases very quickly, unemployment declines to 7.2 percent, and the US current account balance reaches 1.9 percent by the end of 2016—with a debt-to-GDP ratio that, at 97.4 percent, is only slightly higher than in the baseline scenario. An export-led growth strategy may accomplish little more than drawing a small number of scarce customers away from other exporting nations, and the authors expect no net contribution to aggregate demand growth from the financial sector. A further fiscal stimulus is clearly in order, they say, but an ill-timed round of fiscal austerity could result in a perilous situation for Washington. Getting Out of the Recession? Research Scholar Gennaro Zezza updates the Levy Institute’s previous Strategic Analysis (December 2009) and finds that the 2009 increase in public sector aggregate demand was a result of the fiscal stimulus, without which the recession would have been much deeper. He confirms that strong policy action is required to achieve full employment in the medium term, including a persistently high government deficit in the short term. This implies a growing public debt, which is sustainable as long as interest rates are kept at the current low level. The alternative is an ongoing unemployment rate above 10 percent that would represent a higher cost to future generations. Though recent market activity and housing reports give some warrant for optimism, United States economic growth was only 2.8 percent in the third quarter, and the unemployment rate is still very high. 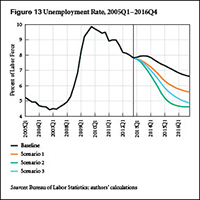 In their new Strategic Analysis, the Levy Institute’s Macro-Modeling Team project that high unemployment will continue to be a problem if fiscal stimulus policies expire and deficit reduction efforts become the policy focus. The authors—President Dimitri B. Papadimitriou and Research Scholars Greg Hannsgen and Gennaro Zezza—argue that continued fiscal stimulus is necessary to reduce unemployment. The resulting federal deficits would be sustainable, they say, as long as they were accompanied by a coordinated and gradual devaluation of the dollar, especially against undervalued Asian currencies—a step necessary to prevent an increase in the current account deficit and ward off the risk of a currency crash. Federal government and Federal Reserve (Fed) liabilities rose sharply in 2008. Who holds these new liabilities, and what effects will they have on the economy? Some economists and politicians warn of impending inflation. In this new Strategic Analysis, the Levy Institute’s Macro-Modeling Team focuses on one positive effect—a badly needed improvement of private sector balance sheets—and suggest some of the reasons why it is unlikely that the surge in Fed and federal government liabilities will cause excessive inflation. In 1930, John Maynard Keynes wrote: “The world has been slow to realise that we are living this year in the shadow of one of the greatest economic catastrophes of modern history.” The same holds true today: we are in the shadow of a global catastrophe, and we need to come to grips with the crisis—fast. According to Senior Scholar James K. Galbraith, two ingrained habits are leading to our failure to do so. The first is the assumption that economies will eventually return to normal on their own—an overly hopeful view that doesn’t take into account the massive pay-down of household debt resulting from the collapse of the banks. The second bad habit is the belief that recovery runs through the banks rather than around them. But credit cannot flow when there are no creditworthy borrowers or profitable projects; banks have failed, and the failure to recognize this is a recipe for wild speculation and control fraud, compounding taxpayer losses. Galbraith outlines a number of measures that are needed now, including realistic economic forecasts, more honest bank auditing, effective financial regulation, measures to forestall evictions and keep people in their homes, and increased public retirement benefits. We are not in a temporary economic lull, an ordinary recession, from which we will emerge to return to business as usual, says Galbraith. Rather, we are at the beginning of a long, painful, profound, and irreversible process of change—we need to start thinking and acting accordingly. The Federal Reserve’s latest flow-of-funds data reveal that household borrowing has fallen sharply lower, bringing about a reversal of the upward trend in household debt. According to the Levy Institute’s macro model, a fall in borrowing has an immediate effect—accounting in this case for most of the 3 percent drop in private expenditure that occurred in the third quarter of 2008—as well as delayed effects; as a result, the decline in real GDP and accompanying rise in unemployment may be substantial in coming quarters. For further details on the Macro-Modeling Team’s latest projections, see the December 2008 Strategic Analysis Prospects for the US and the World: A Crisis That Conventional Remedies Cannot Resolve. The economic recovery plans currently under consideration by the United States and many other countries seem to be concentrated on the possibility of using expansionary fiscal and monetary policies alone. In a new Strategic Analysis, the Levy Institute’s Macro-Modeling Team argues that, however well coordinated, this approach will not be sufficient; what’s required, they say, is a worldwide recovery of output, combined with sustainable balances in international trade. As the government prepares to dispense the tax rebates that largely make up its recently approved $168 billion stimulus package, President Dimitri B. Papadimitriou and Research Scholars Greg Hannsgen and Gennaro Zezza explore the possibility of an additional fiscal stimulus of about $450 billion spread over three quarters—challenging the notion that a larger and more prolonged additional stimulus is unnecessary and will generate inflationary pressures. They find that, given current projections of even a moderate recession, a fiscal stimulus totaling $600 billion would not be too much. They also find that a temporary stimulus—even one lasting four quarters—will have only a temporary effect. An enduring recovery will depend on a prolonged increase in exports, the authors say, due to the weak dollar, a modest increase in imports, and the closing of the current account gap. The US Economy: Is There a Way Out of the Woods? In their latest Strategic Analysis, Distinguished Scholar Wynne Godley, President Dimitri B. Papadimitriou, and Research Scholars Greg Hannsgen and Gennaro Zezza review recent events in the housing and financial markets to obtain a likely scenario for the evolution of household spending in the United States. They forecast a significant drop in borrowing and private expenditure in the coming quarters, with severe consequences for growth and unemployment, unless (1) the US dollar is allowed to continue its fall and thus complete the recovery in the US external imbalance, and (2) fiscal policy shifts its course—as it did in the 2001 recession. The US Economy: What's Next? The collapse in the subprime mortgage market, along with multiple signals of distress in the broader housing market, has already drawn forth a large body of comment. Some people think the upheaval will turn out to be contagious, causing a major slowdown or even a recession later in 2007. Others believe that the turmoil will be contained, and that the US economy will recover quite rapidly and resume the steady growth it has enjoyed during the last four years or so. Yet no participants in the public discussion, so far as we know, have framed their views in the context of a formal model that enables them to draw well-argued conclusions (however conditional) about the magnitude and timing of the impact of recent events on the overall economy in the medium term—not just the next few months. In this new Strategic Analysis, we review what we believe is the most important economic policy issue facing policymakers in the United States and abroad: the prospect of a growth recession in the United States. The possibility of recession is linked to the imbalances in the current account, government, and private sector deficits. The current account balance, which is a negative addition to US aggregate demand, is now likely to be above 6.5 percent of GDP and has been rising steadily for some time. The government balance has improved, again giving no stimulus to demand, which has therefore relied entirely on a large and growing private sector deficit. A rapidly cooling housing market is one of the signs showing that this growth path is likely to break down. We focus first on the current account deficit. Our analysis suggests that a necessary and sufficient condition to address this problem, without dire consequences for unemployment and growth, is that net export demand grow by a sufficient amount. For this to happen, three conditions need to be satisfied: foreign saving has to fall, especially in Europe and East Asia; US saving has to rise; and some mechanism, such as a change in relative prices, should be put in place to help the previous two phenomena translate into an improvement in the US balance of trade. Can the Growth in the US Current Account Deficit Be Sustained? Can the growth in the current account deficit be sustained? How does the flow of deficits feed the stock of debt? How will the burden of servicing this debt affect future deficits and economic growth? President Dimitri B. Papadimitriou and Research Scholars Edward Chilcote and Gennaro Zezza address these and other questions in a new Strategic Analysis. Are Housing Prices, Household Debt, and Growth Sustainable? Rising home prices and low interest rates have fueled the recent surge in mortgage borrowing and enabled consumers to spend at high rates relative to their income. Low interest rates have counterbalanced the growth in debt and acted to dampen the growth in household debt-service burdens. As past Levy Institute Strategic Analyses have pointed out, these trends are not sustainable: household spending relative to income cannot grow indefinitely. 1) If output in the United States grows fast enough to keep unemployment constant between now and 2010, and if there is no further depreciation in the dollar, the deficit in the balance of trade is likely to get worse, perhaps reaching 7.5 per cent by the end of the decade. 2) If the trade deficit does not improve, let alone if it gets worse, there will be a large further deterioration in the United States’ net foreign asset position, so that, with interest rates rising, net income payments from abroad will at last turn negative and the deficit in the current account as a whole could reach at least 8.5 per cent of GDP. How Fragile Is the US Economy? As we projected in a previous Strategic Analysis, the United States' economy experienced growth rates higher than 4 percent in 2004. The question we want to raise in this Strategic Analysis is whether these rates will persist or come back down. We believe that several signs point in the latter direction. In what follows, we analyze the evidence and explore the alternatives facing the US economy. The American economy has grown reasonably fast since the second half of 2003, and the general expectation seems to be that satisfactory growth will continue more or less indefinitely. This paper argues that the expansion may indeed continue through 2004 and for some time beyond. But with the government and external deficits both so large and the private sector so heavily indebted, satisfactory growth in the medium term cannot be achieved without a large, sustained, and discontinuous increase in net export demand. It is doubtful whether this will happen spontaneously, and it certainly will not happen without a cut in domestic absorption of goods and services by the United States which would impart a deflationary impulse to the rest of the world. We make no short-term forecast. Instead, using a model rooted in a consistent system of stock and flow variables, we trace out a range of possible medium term scenarios in order to evaluate strategic predicaments and policy options without being at all precise about timing. Wynne Godley, our Levy Institute colleague, has warned since 1999 that the falling personal saving and rising borrowing trends that had powered the US economic expansion were not sustainable. He also warned that when these trends were reversed, as has happened in other countries, the expansion would come to a halt unless there were major changes in fiscal policy. Not long ago, official circles insisted that monetary policy was the most desirable tool, that fiscal deficits were not only unnecessary but also harmful (ERP 2000, pp.31–34; Greenspan 2000). Some economists, notably Edmund Phelps of Columbia University, went so far as to suggest that the economic expansion was not caused by rising demand, but rather because growth had become 'structural' (Financial Times, August 9, 2000). These are fast-moving times. Two years ago, the Congressional Budget Office (CBO, 2001) projected a federal budget surplus of $172 billion for fiscal year 2003. Within a year, the projected figure had changed to a deficit of $145 billion (CBO 2002). The actual figure, near the end of fiscal year 2003, turned out to be a deficit of about $390 billion. And just one month ago, President Bush submitted a request to Congress for an additional $87 billion appropriation for war expenditures, over and above the $166 billion tallied so far. It is widely anticipated that even this will have to be revised upward by the end of the coming year (Stevenson 2003; Firestone 2003). Right through the boom years prior to 2001, the American economy faced a strategic predicament in that the main engine of growth (credit-financed private spending) was unsustainable, from which it followed that the whole stance of the government's fiscal policy would have to be radically changed if the New Economy were not to become stagnant. The boom was indeed broken, because private expenditure fell relative to income. The potentially dire effects on the level of activity were mitigated by a transformation in the fiscal policy stance, accompanied by a radical change in attitudes toward budget deficits, which suddenly became respectable. This analysis argues that a new strategic predicament is on the horizon as a result of the exceptionally large and growing balance of payments deficit. The long economic expansion was fueled by an unprecedented rise in private expenditure relative to income, financed by a growing flow of net credit to the private. On the surface, it seemed that the growing burden of the household sector’s debt was counterbalanced by a spectacular rise in the relative value of its financial assets, but this was never a match among equals, and the great meltdown in the financial markets has proved this imbalance to be true. The private sector has dramatically cut back its acquisition of new credit and reversed the path of its financial balance, but this adjustment has been uneven within the sector: the business sector has suffered a huge drop in investment while the household sector has continued to borrow. Notwithstanding the great achievements of the American economy, the growth of aggregate demand during the past several years has been structured in a way that would eventually prove unsustainable. During the main period of economic expansion, the fiscal stance tightened at a much greater pace than in any period during the previous 40 years, and net export demand progressively deteriorated to record deficit levels. It follows that the expansion aggregate demand had been driven by a similarly unprecedented expansion of private expenditure relative to income, financed by growing injections of net credit, which caused the indebtedness of the nonfinancial private sector to escalate to unprecedented levels. The conclusion drawn was that this process must come to an end at some stage, and that when it did, the entire stance of fiscal policy would have to move in an expansionary direction, and that for economic growth to be sustained indefinitely, net export demand would have to recover as well. The United States should now be prepared for one of the deepest and most intractable recessions of the post–World War II period, with no natural process of recovery in prospect unless a large and complex reorientation of policy occurs both here and in the rest of the world. The grounds for reaching this somber conclusion are that very large structural imbalances, with unique characteristics, have been allowed to develop. These imbalances were always bound to unravel at some stage, and it now looks as though the unraveling is well under way. There may be no spontaneous recovery because the unraveling that has started is a reversion toward what, in the relevant sense, is a normal situation. This consideration leads us to take issue with some distinguished commentators, such as Alan Blinder (2001) and Laura Tyson (2001), who apparently assume that because a spontaneous recovery will occur relatively soon, any fiscal relaxation should be temporary. The general predicament is made worse by a deteriorating world economy; US exports fell sharply in the first seven months of 2001, when the balance of payments was already heavily in deficit. As the Implosion Begins . . . ? Distinguished Scholar Wynne Godley and Research Scholar Alex Izurieta respond to Jan Hatzius’s rebuttal of their July 2001 Strategic Analysis, in which they stated that the American economy was probably already in recession, and that a prolonged period of subnormal growth and rising unemployment was likely unless there were another round of policy changes. Hatzius, a senior economist with Goldman Sachs, vigorously disagreed. The American economy is probably now in recession, and a prolonged period of subnormal growth and rising unemployment is likely unless there is another round of policy changes. A further relaxation of fiscal policy will probably be needed, but if a satisfactory rate of growth is to be sustained, this will have to be complemented by measures that raise exports relative to imports. If the United States’ balance of trade does not improve, the country could eventually find itself in a “debt trap,” the author says. The aim of this paper, the second in a series offering Godley’s strategic analysis, is to display what seems reasonably likely to happen if world output recovers but otherwise past trends, policies, and relationships continue. The potential usefulness of the exercise is to warn policymakers of dangers that may exist and to help them think out what policy instruments are, or should be made, available to deal with worst cases, should they arise.